Vliegveldweg 86, 6199 Maastricht, Nierderlande. 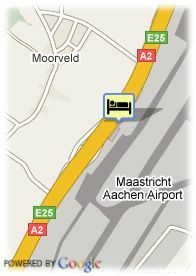 The Tulip Inn Maastricht - Aachen Airport is located next to the airport of Maastricht and on the highway E25/A2 (exit 50), so easy to access by car. The centre of Maastricht, one of the oldest and cosiest cities of the Netherlands can be found after a 15 minutes drive from the hotel. This location makes the hotel perfectly suitable for business travellers who want to make use of the airport or guests who want to see the interesting cultural sights of Maastricht and enjoy the Limburg hospitality in one of the little bars or restaurants. Maastricht, the oldest city in the Netherlands and founded by the Romans, has an exceptionally wide appeal with its many monuments and annual festivities and events. The beautiful countryside in the province of Limburg and other neighbouring countries serve to make your stay even more interesting. Kinder weniger als 4 Jahr(e) alt: gratis. Visa, Diners Club, Mastercard, Pinpas, American Express. The hotel serves a continental breakfast buffet which can be enjoyed on a daily basis. During the week the breakfast is available from 06:30h. to 10:00h. and during the weekend from 07:00h. untill 10:30h. Enjoy the culinary surprises of our restaurant Concorde where the kitchen staff offers you Mediterranean dishes, tapas and other surprising specialties. You are also welcome to tast one of our delicious 3 or 4 course menus. In case you prefer a quick lunch or snack, no problem, our kitchen staff will do their utmost to please you. During the summerseason you can enjoy yourself on our terrace. From here you have an unique view on the landing track from the airport. Maastricht constitutes an ideal city for shoppers by virtue of the large number of shops and department stores in the city-centre region between the Vrijthof square and the railway station. A day’s shopping in Maastricht provides visitors with both an appealing and a very special experience, since the majority of the city’s stores are located in historical streets. On Wednesday and Friday morning there is a general market on the Market square, around the City Hall, from 8.00 am - 1.00 pm. The Fish-market takes place on Friday in the Boschstraat. On Saturday there is a flea market in Stationsstraat, from 10.00 am - 4.00 pm (opposite the railway station). The ultimate holiday feeling comes naturally in Limburg, a unique part of the Netherlands with an exotic atmosphere all its own. Try a cool glass of beer from a local family brewery. Or a cup of coffee and a slice of genuine Limburg pastry, fresh from the oven. Limburg boasts many restaurants. In addition to French and Belgium influences, you will find typical regional dishes such as asparagus, mushrooms and the 'Rommedoeke', the best known Limburger cheese. Accompanied, of course, by a good glass of Limburg wine. Limburg is known for its bronze-green oak woods. But it also offers meadows and fields, an open landscape through which the river Meuse quietly meanders. An orchard full of blossoming fruit trees. You can smell it, see it and experience it. Both hill country and flat land, varying from forested slopes to vast asparagus fields. With a touch of green from the Meuse valley, a dash of purple from the heather and a warm brown-reddish glow from the Peel. There is something for everyone in the Province of Limburg. Maastricht certainly lives up to its reputation of being an “arty” city. Not only because it has several academies of art and music, but especially because of all there is to see. Ancient and modern art can be seen in the Bonnefanten Museum, where the permanent collection is complemented with a wide range of temporary exhibitions. The city also has a great number of galleries where contemporarysartists exhibit their work. And on the streets... there you will find a ‘permanent exhibition’ of statues by such wellknown Dutch sculptors as Mari Andriessen, Charles Eyck, Arthur Spronken, Willem Hofhuizen en Piet Killaars. On this walk, the official VVV Tourist Office guide will show you the prettiest spots in the old city centre, including the Stokstraat Quarter, the Basilica of Our Lady on the O.L.Vrouweplein, the Rampaarts, the Parks, the Jeker Quarter and Vrijthof Square with the Church of St.Jan and the Basilica of St. Servatius. During the Autumn holiday, there are (official) guided tours of the fortifications of this, the oldest fortified city of the Netherlands, focussing on the military history of Maastricht. Between 1575 and 1825, mining activities created a network of galleries at Maastricht's western limits. These mining galleries were used in times of siege for subterranean approach and elimination of the enemy. The tour lasts about 1 hour and is led by an official VVV Tourist Office guide who gives the visitor an impression of the 'how and why' of this unique military monument, with is domed vaults, impressive shellproof refuges, powder rooms, plunging steps and a variety of galleries. Fort St.Pieter lies at the northern most point of Mount St.Pieter and was constructed in 1701-1702. It rises up from a pentagonal base-plan, with two major galleries at its centre and a circumferential gallery round its five sides. An official VVV Tourist Office guide will show you round these galleries and the shell-proof chambers; you can look down into the depths of the water-well and, weather permitting, climb up to enjoy the magnificent view across the city and surrounding countryside. The guided tour takes about one hour. Would you like to see a city from the river Maas? Then step aboard on one of the river boats waiting for you throughout the summer season. Your host on the cruise takes you along Mount St.Pieter, the hill with the famed limestone caves, to the complex of sluices at Ternaaien (Belgian border) and back again. The famous 'St. Pietersberg' caves are the result of centuries of excavation of marl, a building stone. What we now see is an enormous labyrinth of more than 20,000 passages. The stone-hewers have left their marks. On the walls are interesting inscriptions, some extremely old; artists too, have been at work here. During the many sieges Maastricht has suffered, and also during the last world war, local inhabitants used the passages as a shelter; some of the emergency provisions are still to be seen. The temperature in the caves is 9-10 degrees Celsius; visitors are therefore advised to take a cardigan, pullover or coat with them. The round-trips, which last about an hour, are led by official VVV Tourist Office guides. Two sections of the labyrinths of Mount St. Pieter are open to the public. Thermae 2000, Spa of wellness: Sauna, whirlpools, indoor and outdoor swimming pools, beauty lounge, Turkish steam bath, every kind of modern beauty treatments: massages and revitalising body care. In the shadows of the city, on the banks of the green hills, Apart Hotel Randwyck is ideally situated.